Your positive pregnancy test marks a new beginning. The time has come to start thinking about what lies ahead. After you decide who your practitioner will be, give the office a call to find out how to proceed. Some practices want you to come in for a visit with the office nurse to give a medical history and confirm your good news with either a blood or urine test, whereas others schedule a first visit with the practitioner. How soon your first visit will be scheduled depends in part on your past or current history. If you didn’t have a preconceptional visit beforehand, and you haven’t been on prenatal vitamins or other vitamins containing folic acid, let the office know. A prescription for prenatal vitamins can be called in so you can start taking them even before your first prenatal visit. All over-the-counter adult multi- and prenatal vitamins should have the correct dose of folic acid so the typical patient doesn’t need a prescription for them, but ask the pharmacist if you’re not sure. Also, some insurance companies may cover prescription vitamins but not over-the-counter ones, and some women just simply prefer one particular type of vitamin. Some things are consistent from trimester to trimester — like checking your blood pressure, urine, and the baby’s heartbeat. See the table for an overview of a typical schedule for prenatal visits. If you develop problems during pregnancy or if your pregnancy is considered “high risk,” your practitioner may suggest that you come in more frequently. This schedule of prenatal visits isn’t set in stone. If you’re planning a vacation or need to miss a prenatal visit, tell your practitioner and reschedule your appointment. If your pregnancy is going smoothly, rescheduling usually isn’t a big deal. However, because some prenatal tests have to be performed at specific times during pregnancy, just make sure that missing an appointment won’t affect any of these tests. A nurse checks your weight and blood pressure. You give a urine sample (usually an easy job for most pregnant women!). Your practitioner checks for the presence of protein or glucose, which may be a sign of preeclampsia or diabetes. Some urine tests also enable your doctor to look for any indications of a urinary tract infection. Starting sometime after 14 to 16 weeks, a nurse or doctor measures your fundal height. 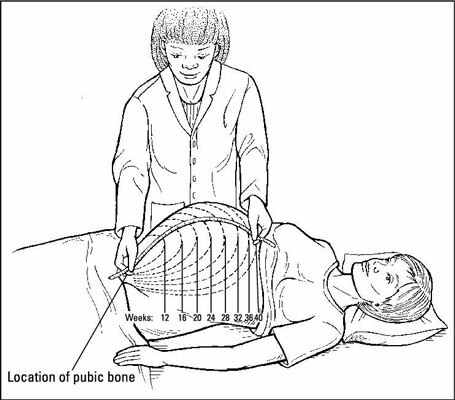 The practitioner uses either a tape measure or her hands to measure your uterus. This gives her a rough idea of how the baby is growing and whether you have an adequate amount of amniotic fluid. The fundal height measurement may not be useful in women who are expecting two or more babies or in women who have large fibroids (in both cases, the uterus is much bigger than normal) or in women who are very obese (because it can be difficult to feel the top of the uterus). A nurse or doctor listens for and counts the baby’s heartbeat. Typically, the heartbeat ranges between 120 and 160 beats per minute. Most offices use an electronic Doppler device to check the baby’s heartbeat. With this method, the baby’s heartbeat sounds sort of like horses galloping inside the womb. Sometimes, you can hear the heartbeat as early as 8 or 9 weeks using this method, but often it isn’t clearly discernible until 10 to 12 weeks. Prior to the availability of Doppler, a special stethoscope called a fetoscope was used to hear the baby’s heartbeat. Using this method, the doctor can hear the heartbeat around 20 weeks. A third way of checking the baby’s heartbeat is by seeing it on ultrasound. The heart beating away can frequently be seen at around 6 weeks. In some practices, a medical assistant or nurse performs tasks such as checking your blood pressure; in other practices, a doctor may perform this task. No matter who performs the technical components of the prenatal visit, you should always have the opportunity to ask a practitioner questions before leaving the office.